The Italian firms of OTO-Melara and Fiat had worked together and developed the OF 40 (OTO-Fiat 40 tonne) main battle tank. However, they classed it unusually as a ‘medium battle tank’, one of “nearly unlimited cross-country mobility” to quote the sales literature. The OF-40 was first unveiled in 1980 and quickly received orders from the United Arab Emirates (UAE). The Mk.2 upgraded version was released shortly thereafter being trialed in August 1982 with features optimised for fighting in the desert and to rectify the deficiencies of the earlier vehicle which had been highlighted by the customer. The most critical deficiency being that the Mk.1 tank was unable to fire on the move due to a lack of fully stabilized sights. Another complaint from the UAE was the main armament. The UAE wanted a 120mm main gun but, like the Mk.1, the Mk.2’s main armament was the OTO-Melara 105mm L/52 rifled main gun. 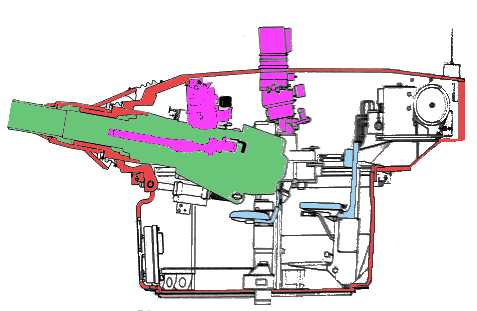 The main gun was mounted in the turret with a semiautomatic falling-wedge type breech, spring recuperator, and concentric buffer. This gun is not the same as the Royal Ordnance 105mm gun L/52 gun but is very similar and the ammunition was compatible. Alongside this was a 7.62mm FN MAG coaxial machine gun and a second 7.62mm FN MAG machine gun for anti-aircraft protection. It is important to note that the machine guns would not be supplied with the tank and would have to be purchased and fitted separately. A battery of 4 smoke projectors was mounted on each side of the turret. The 105mm gun could fire HEAT (High-Explosive Anti-Tank), HESH (High-Explosive Squash-Head), and APDS (Armor-Piercing Discarding-Sabot) ammunition all of which were fired electrically. The gun, being electro-hydraulically operated, returned to ‘battery’ for reloading automatically after being fired. Other NATO compliant 105mm ammunition could also be used, such as smoke and canister rounds. The gun was fully stabilized permitting fire on the move and the commander was able to override the control, sight and fire the gun himself, a very useful combat feature. Additionally, should the electrical systems fail, all of the weapon systems could be moved and fired manually. The optical equipment and fire control on the Mk1 were too austere therefore the Mk.2 version added a package of electrical and optical devices. The Mk.2 featured the same SFIM (Societe de Fabrication d’Instruments de Mesure) VS580-B panoramic sight day/night sight for the commander as on the Mk.1 except that it was self-stabilized during panoramic search and also matched to the gun for firing. Also, the same coaxial C215 telescope made by Alenia and an Officine Galileo built OG14LR or OG14LR2A/B digital fire control system and gunner’s primary sight was used. The OG14LR2A featured a stabilization system with meteorological sensors and the ‘B’ system added a stabilized line of sight to this. Laser range finding was by means of the Selenia VAQ33 neodymium yttrium-aluminum-garnet laser rangefinder made by Alenia and had a range of up to 10km (6 miles). Additionally, there was an optional model PZB 200 LLLTV (Low Light Level Television) camera made by AEG Telefunken with monitor and additional firing computer. Despite these improvements to the 105mm main gun, the customer still desired a 120mm gun armed tank and, although the 120mm L/44 smoothbore gun developed for the C1 Ariete could also be fitted into the OF 40, this development came too late and is not known to have been put into practice. Such a change would have created significant issues with having to completely reorganize all of the internal ammunition stowage, fire control, and many other internal components. The muzzle velocity for the APDS shell is 1,470m/s, 1,170m/s for the HEAT and 730m/s for the HESH, and the gun can be fired at a maximum rate of 9 rounds per minute. Elevation and depression for the main gun is from -9 degrees to +20 degrees. Maximum range the gun is sighted for is 6000 meters. Although both Mk.1 and Mk.2 had the same gun and could both fire all 105mm NATO complaint ammunition only the Mk.2 was specifically advertised as being able to use canister and smoke type ammunition. The coaxial machine gun can, if needed, could be used to assist in ranging as it is matched ballistically to the main gun. Only 15 rounds for the main gun were carried in a redesigned internal stowage in the turret along with 2500 rounds for the machine guns. A further 42 rounds for the main gun were carried in an ammunition rack in the front left of the hull. An additional 3000 rounds of ammunition for the machine guns are carried in the hull. The rearrangement of ammunition inside the Mk.2 meant this tank could only carry 57 rounds for the main gun. 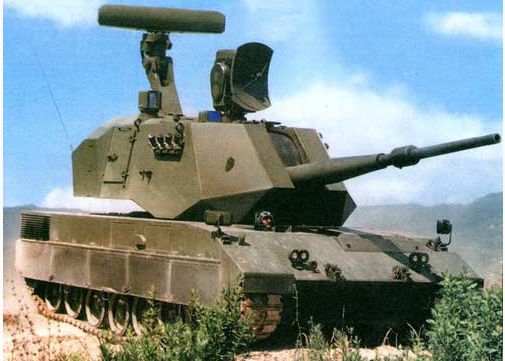 Made from plates of welded rolled homogeneous steel armor plate and using spaced armor in critical areas, the turret is carried around the ring on steel ball bearings and is capable of being traversed 360 degrees at a speed between 0.5 degrees per second up to 21.2 degrees per second. This is slightly slower than the Mk.1 by taking one additional second to rotate 360 degrees (17 seconds for full traverse instead of 16). The elimination of shot traps was considered important and the ring for the turret is protected by a ballistic deflector. The hull is made from welded rolled homogeneous armor steel with spaced armor in critical areas and with the crew compartment divided off from the engine area. The driver is seated in the front right with the ammunition stowed in the hull to his left, and by his seat is a floor escape hatch. The seven wheel stations each have double wheels and are connected via swing arms to torsion bars. Drive is delivered to the steel tracks by a rear drive sprocket and the rubber block track is carried on its return by 5 support rollers. Five hydraulic shock absorbers are fitted on each side and conical springs prevent the wheels from deflecting too far causing damage to the bar or arm. Armament 105mm L/52 rifled gun with 57 rounds, coaxial 7.62mm machine gun and 7.62mm anti-aircraft machine gun with 5500 rounds. Modern Armor. (1978). Pierangelo Caiti, Squadron Signal Publications. The gunner is equipped with a laser range finder and an x8 optical telescope and the commander’s position is fitted with a panoramic periscope with an optional French SFIM stabilized day night sight for target surveillance and acquisition. Episcopes are also provided for the crew with 8 for the commander, 1 for the gunner, 2 for the loader, and 3 for the driver. An additional night driving sight is available for the driver. The OF 40 is equipped with the same V-10 ten cylinder license built Fiat Diesel engine and is supercharged (2 superchargers), rated at 830hp at 2200rpm and delivering 286kgm of torque at 1500rpm. The previous Mk.1 advertised an engine output maximum at 850hp and 295kgm of torque. The engine is connected to a fully automatic gearbox with a hydraulic torque converter and the gears are electrically selected with options for 4 forward and 2 reverse gears permitted a faster maximum forward and reverse speed than the Mk.1. As with the Mk.1, in the event of an electrical failure, a manual override can be used for second gear. Additionally, this Mk.2 featured two liquid coolers with thermostatically controlled fans specifically designed for desert conditions. There were additional tropicalisation features added controlling the fuel supply to prevent overheating in desert conditions and a cyclone filter to ensure the air intake remains dust free. This combination delivers a power to weight ratio for the OF-40 Mk.1 of 19.3 hp/t. The two fuel tanks inside, located on each side of the engine compartment, hold a total of approximately 1000 liters of diesel which is estimated to provide a range of up to 600km on road. The entire power pack consisting of engine, transmission and cooling system could be replaced by a team of 4 men with a crane in just 45 minutes. The United Arab Emirates had been unhappy with the relatively poor mobility of the OF 40 despite the claims of the manufacturers and as a result, Fiat offered two options. One was the refitting of their own Fiat MTCA V-12 supercharged diesel engine producing 1,000 hp or further enhanced to 1,200 hp. A final simpler option was to simply enhance the existing 830hp engine as already fitted to deliver 950hp. None of these three options is thought to have taken place. 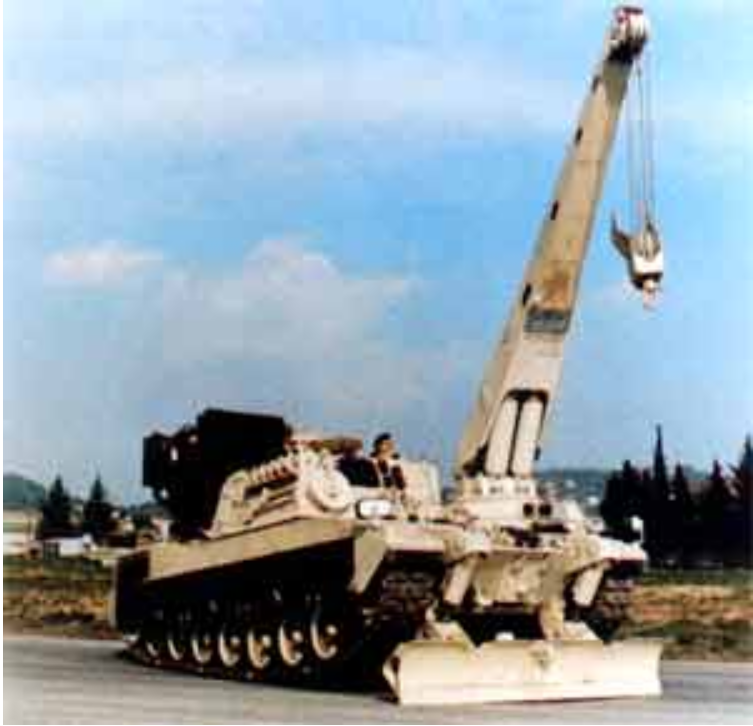 This variant was developed and produced by OTO-Melara and Fiat specifically for the needs of the United Arab Emirates and featured a bulldozer blade, for clearing obstacles but which also acted as a stabiliser when using the crane. The recovery crane mounted on the hull was capable of lifting 18 tonnes with the blade in the support position and less with it raised. The winch on the jib can be used in the lowered position for basic towing, with a tractive effort of 35tonnes. These additions increased the weight of the OF 40 to 45 tonnes when fully laden. The driver’s position remained the same in the front right but the other three crew were positioned in a fixed casemate structure mounted over the turret ring. The OTO-Melara built 76mm automatic anti-aircraft gun and turret was available for sale with this chassis. Other than a single prototype, no serial manufacturing is known to have taken place. 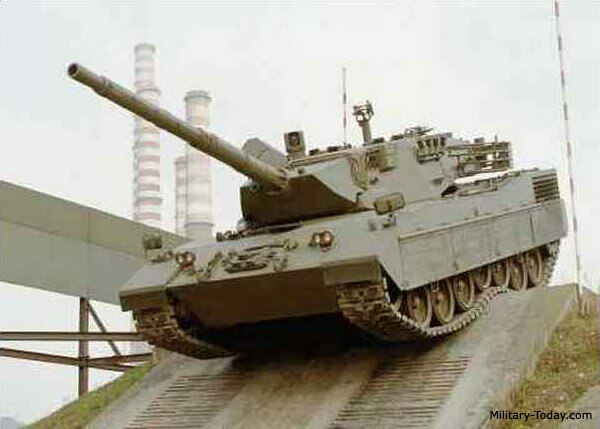 Components for the C1 Ariete MBT were tested, including the turret, on an OF 40. The OTO-Melara made 155mm gunned Palmaria turret. 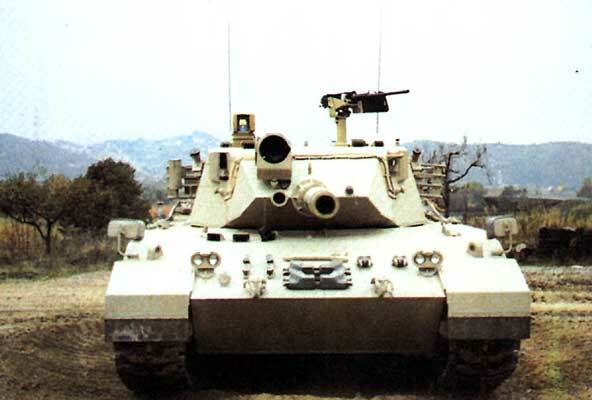 For the Palmaria SPG this was mounted onto a variant of the OF 40 hull – production complete with approximately 160 examples produced for Libya and a further 25 for Nigeria. Developed between 2005 and 2010, as a joint venture between the UAE and Belgian firm of Sabiex. The project involved the reversing of the vehicle with the engine at the front and the former driver’s space and area under the turret repurposed for troops. 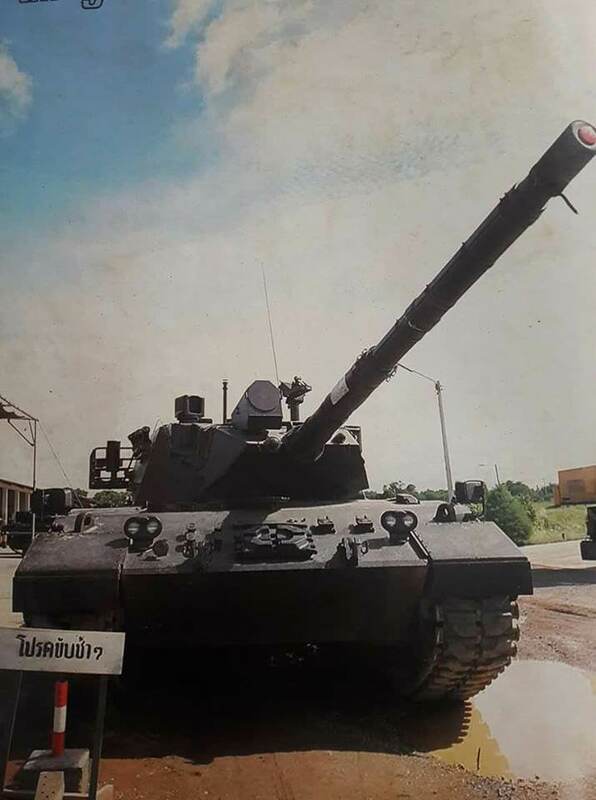 Vehicle fitted with a BMP-3 turret. One vehicle made. The OF 40 was a capable tank, better than the Leopard 1 Italy had in service. Free from any export problems it was an ideal tank for Italy to promote and sell. Despite garnering interest from various countries and being rapidly upgraded to a Mk.2 configuration, the OF 40 only entered service with the United Arab Emirates. Despite the improvements made for the UAE then, they were still unhappy. The mobility was too low, the gun too small, and there were complaints that the commander’s sight was not fully stabilized. The vehicle was replaced in UAE service with the French Leclerc instead. Originally 18 Mk.1 examples were built, which were subsequently all upgraded to Mk.2 status. 18 additional vehicles built as Mk.2’s were manufactured as well. It is reported that 39 (including test-bed hulls) OF 40 vehicles were manufactured. No OF 40’s are known to be in service today with the final vehicles officially withdrawn from front-line service with the UAE. As of 2014 the UAE still officially listed some 36 OF 40’s as part of their military forces, presumably in reserve or storage. Rendition of the OF-40 Mk. 2 by Jarosław Janas, funded by our Patreon Campaign. I am missing a number of units built in the headline. is there any chance we are getting a page on the OTOMATIC 76 mm SPAAG ? Thank you for the kind words! We are definitely looking at tackling the OTOMATIC, but unfortunately there is no work being done on it as of now.